There are several possible reasons for errors during file load or scanning. 1) out of memory when trying to open very large files or scanning at very high DPI. - try adjusting Windows memory heap size as described in this article. Warning! This is risky, mistakes during this procedure can break your system. 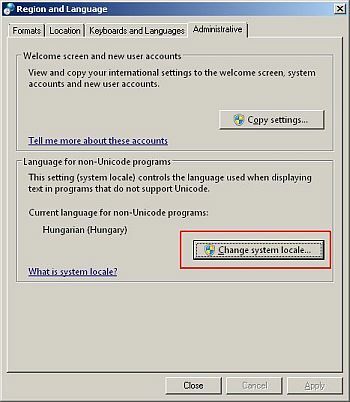 Some systems may have problems opening files or directories that contain non-english characters. Please try to change your system locale to the correct (non-english) one, for example if you are using hebrew filenames, change to hebrew. - Start the Region and Language applet. - Click Change system locale button on the Administrative tab. - Choose the appropriate language and restart AutoSplitter. If this does not help, the file might be corrupted or locked by another program - or simply does not exist.